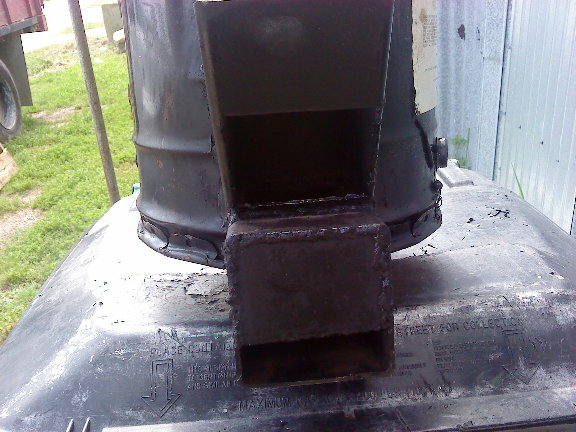 A rocket stove achieves efficient combustion of the fuel at a high temperature by ensuring that there is a good air draft into the fire, controlled use of fuel, complete combustion of volatiles, and efficient use of the resultant heat. It has been used for cooking purposes in many third-world locales (notably Rwandan refugee camps) as well as for space and water heating. 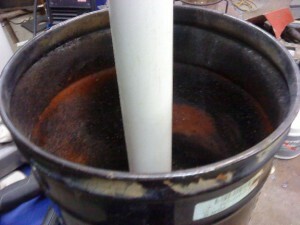 Heat exchanger: To transfer the heat to where it is needed, i.e. the cooking pot. The fuel magazine can be horizontal where additional fuel will be added manually or vertically for automatic feeding of fuel. 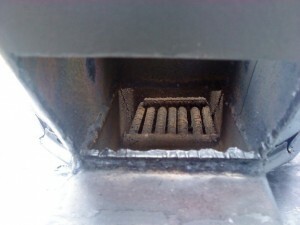 As the fuel burns within the combustion chamber convection draws new air into the combustion chamber from below ensuring that any smoke from smoldering wood near to the fire is also drawn into the fire and up the chimney. The chimney can be insulated to maximize the temperature and improve combustion, according to studies this will increase efficiency by up to two percent more. In a rocket mass heater the heat is passed into a suitable heat exchanger to ensure the efficient use of the generated heat. For cooking purposes the design keeps the cooking vessel in contact with the fire over the largest possible surface area. 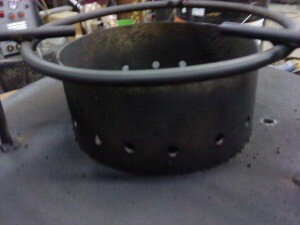 A pot skirt can be used to create a narrow channel which forces hot air and gas to flow along the bottom and sides of the cooking vessel. Optional baffles guide hot air and flame up the sides of the pot. For space heating purposes the heat is transferred to a heat store which can in some cases be part of the structure of the house itself. The exhaust gasses then pass out of the building via the chimney. The design of stove allows it to operate on about half as much fuel as a traditional open fire and can use smaller diameter wood. If they are insulated and raised from the floor this reduces the danger of children burning themselves. Some more recent designs are self feeding using gravity to add fuel to the fire as required. 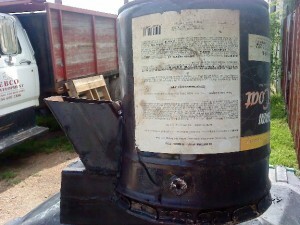 A precursor to the rocket stove was the argand lamp which was patented in 1780. This was a major development of the traditional oil lamp which introduced a glass chimney above the flame to increase air-flow. As well as being used for lighting, this design was also used for cooking and heating water due to its ‘affording much the strongest heat without smoke’. Dr. Larry Winiarski, now Technical Director of Aprovecho, began developing the Rocket Stove in 1980 based on a VITA stove, designed by Sam Baldwin, using the systems developed by the Romans in hypocaust heating and cooking systems. and discovered the principles of the Rocket stove in 1982. TWP and AHDESA were winners at the Ashden Awards for Sustainable Energy in 2005 in the ‘Health and Welfare’ category for their work in Honduras with the ‘Justa Stove’ which is based on principles of the rocket stove. Aprovecho were winners of the Special Africa Award at the Ashden Awards in 2006 for their work with rocket stoves for institutional cooking in Lesotho, Malawi, Uganda, Mozambique, Tanzania and Zambia. 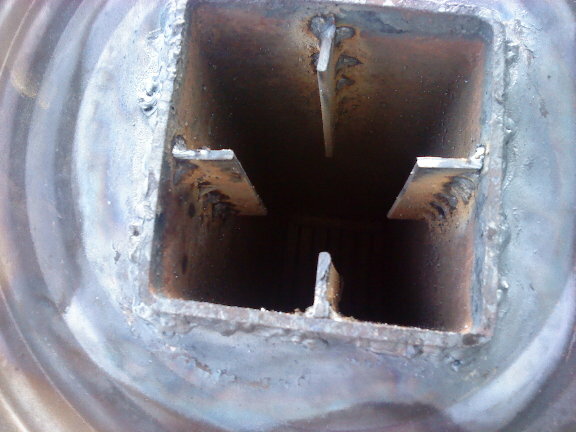 The rocket stove was originally developed for cooking purposes where a relatively small amount of heat is required on a continuous basis, applied to the bottom and sides of a cooking pot. Stoves can be constructed from brick, recycled steel cans, steel sheet metal, or can be purchased. Rocket Stoves are found more commonly in third world countries where wood fuel sources are more scarce, but they have seen increased use in developed countries, such as the United States, in recent years. Some are small for portability, with insulation inside a double-walled design and a chamber for partial biomass gasification and additional mixing to increase BTU production and to provide a cleaner, more complete burn. The advantage of rocket stoves is the very little fuel they need, such as wood and dry weeds, to be able to cook a whole meal with it, keeping the air more clean with less hydrocarbons and carbon monoxide. The rocket mass heater uses the rocket stove principle within a system designed to both heat air directly and also to transfer much of the heat from the flue gasses into a thermal energy storage, often made of cob. Described in detail in 2006, these heaters are becoming popular with DIY builders, in natural buildings and within permaculture systems. Rocket stoves can be used to heat water via a heat exchanger which transfers heat to a body of water in a nearby container. As we who live in the industrialized nations of the world are increasingly forced to tighten our belts and live less energy-intensive lives, we might do well to examine the gentler technology of the so-called “underdeveloped” countries for “new” recycling and fueling ideas. I’m indebted, therefore, to B.R. Saubolle, S.J.—of Katmandu, Nepal—or telling my readers how some inhabitants of the Indian subcontinent derive useful heat from what is commonly considered a waste material in the U.S. and Canada. Perhaps we need more of this “reverse” Peace Corps work.—MOTHER. Sawdust will burn properly only in a specially constructed stove, which is very simple to make and costs practically nothing. The fuel always lights with only one match in such a unit, and can be kept ablaze for long periods—six, eight or even twelve hours if desired—with absolutely no smoke, no blowing or fanning and no refueling. Once lighted, such a stove burns until all the fuel it contains is consumed. It can then be recharged and lighted again. Such a device is ideal where steady heat is required for hours on end with no attention (to provide day-long hot water, for instance, or to keep a sickroom cosy and warm through a chill winter’s night). 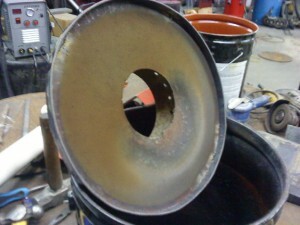 To make a sawdust stove, take a large paint can, remove the top and cut a two-inch hole in the middle of the bottom. Set the container up on three legs, and the stove is ready. The only “tool” you’ll need to make your burner work is a smooth round stick or length of water pipe which will fit through the hole in the bottom of the can. 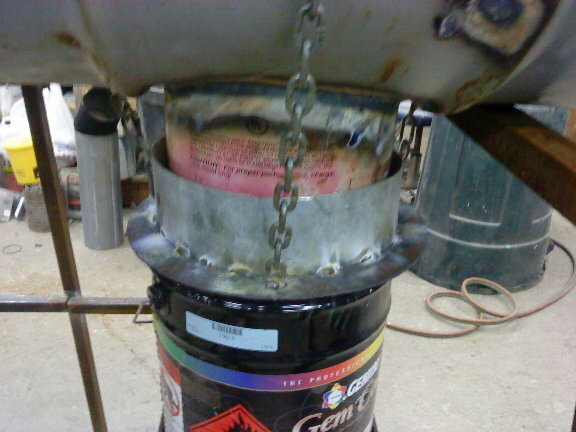 It should be long enough to protrude four inches above the can’s top edge when the shaft is passed vertically through the stove and its lower end rests on the ground. 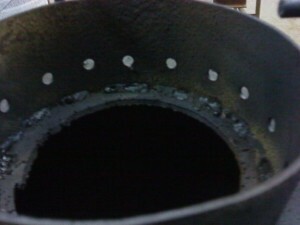 It is absolutely essential that the fuel for this stove be bone dry. If it’s slightly damp, it will smoke. . . and if it’s very damp it won’t light at all. Dry sawdust burns wonderfully well—sometimes even with a blue flame—and is entirely smokeless. It does give off some fumes, however, and the room where the stove is in use must be well ventilated. To load the burner, insert the stick or pipe through the hole in the bottom of the can and hold the shaft straight up while you pour sawdust around it. Every now and then, as you fill the container, press the fuel down—the harder the better—to make it tight and compact. 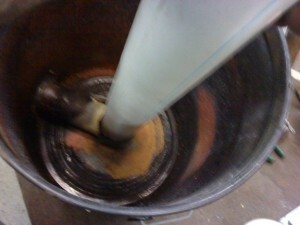 When the can is full, completely cover the top of the sawdust with a thin, even layer of sand or ashes. 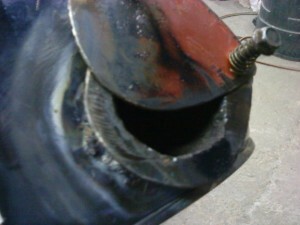 Then twist the pipe back and forth and carefully pull it out of the packed fuel. You’ll have a neat hole—which will act as a chimney—right through the mass. The powdered wood burns from the center outward, the hole gradually increasing in diameter until there is no sawdust left and the flame dies out. The rate of consumption is about an inch and a half to two inches per hour (the figure varies slightly with the quality of the fuel and how tightly it’s packed). A stove one foot in diameter will burn about six hours, and one eight inches across will operate long enough to cook a meal and produce some hot water to wash the pots and pans. The amount of heat produced is regulated by the depth of the container: the longer the chimney, the hotter the flame. A tall, narrow stove will become very hot for a relatively short time, a broad, squat model will give a gentler heat for a longer period and a tall, wide drum will burn both long and hot. Calculate the dimensions to suit your requirements. The basic design can be adapted to special purposes. For example, a good sawdust-fired kitchen range can constructed in either of two ways: Two or more legless drum stoves can be bricked in, with a small opening b low each to admit air and remove ashes. The stove can be built brickwork alone, without drums, and two-inch round hole made through the wall into the bottom of the firebox. This second model is filled with the help of two sticks or pipes. One is first is pushed through the front opening least as far as the center of the stove and the other is held upright so that rests on the horizontal rod. Then the unit is packed with fuel and both sticks are drawn out. basic sawdust burner may be modified into a space heater to d laundry on a rainy day or warm a living room on a cold night. 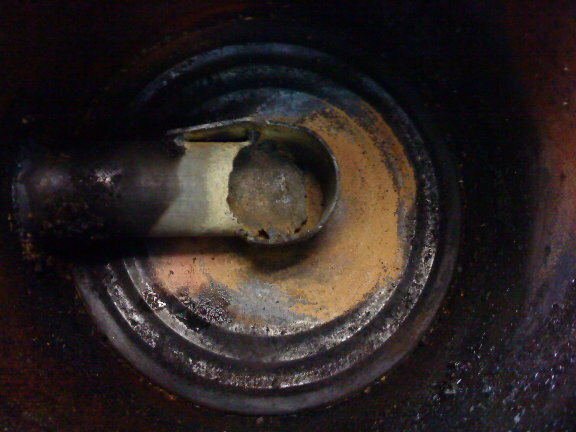 To adapt a can stove for this purpose, a second container (with its top removed) turned upside down and fitted snug onto the upper rim of the heater. This radiates warmth into the room. An opening is made in the upper chamber near the top, to receive a stovepipe which carries any fumes out through a wall or window. If desired, a hole with a removable cover could be cut in the top to make an open burner for heating a kettle.Whether you decide to modify the basic sawdust burner I’ve described or not, I think you’ll find the device presents a most efficient means of using a common waste. I know you’ll also finds that it produces steady, reliable heat for cooking and/or warmth. And now my design sawdust stove !!! Works after packing the sawdust about 3-4 hours with out any smoke. The difference between my design and other sawdust stoves is that I installedon the bottom an airdraft controlling chamber. The top lid is a 3/16″ steel with half inch rim on the bottom which secures the lid on the bucket. On the top of the lid I made a chamber extension with 5/16″ holes around. That creates better updraft and more excellent burning without smoke. 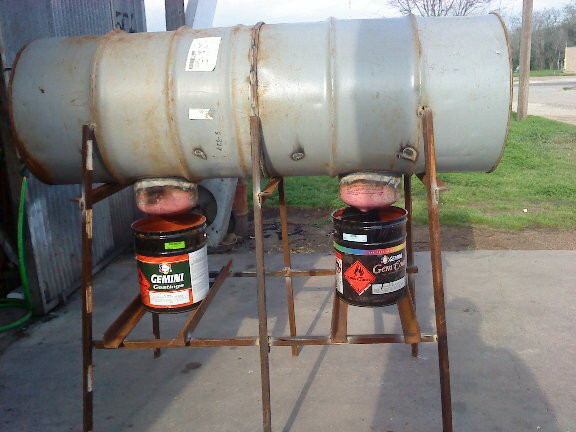 Remove the pipe and install the lid. Ignite the sawdust from the bottom from the aircontroll chamber. Now you can cook a gulash . Have good time! Two 55 gallon barrel welded to each other, and the water boles is two half freon tanks. 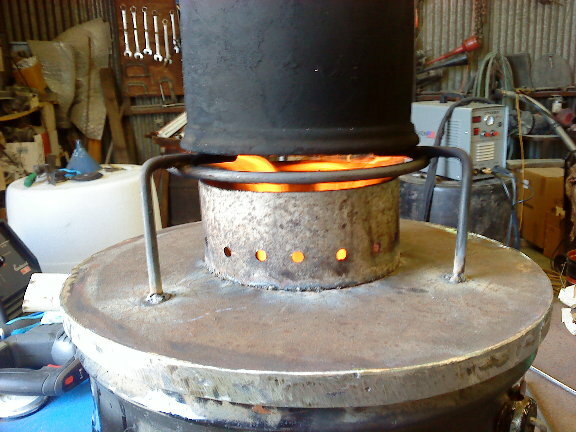 I made a skirt ower the rocket stove to concentrate the heat under the waterbole Top of the chaimber welded some rainforcement to against heat deformation. Rocket stove housing regular 5 gallon paint bucket. Grade made from 3/8 rebar stock. Possile to load the firewood from multiple directions. Horizontal or from up 30 or 45 angle.